The Rebel Sweetheart. : An OFW Family's Key to Survival. Skype: Bridging the distance of 1,627 miles. How we cope with the homesickness and the loneliness. Thank goodness for Skype. We probably couldn't have make it through without you. Linking up with BPC, Wordless Wednesdays, Wednesday Whites, and Thankful Thursdays. Hello! Following you from this Time For Sharing Tuesday linky! Btw, im inviting you to support and join my giveaway. Share na rin to other mommies who might get interested of winning pregnancy and toddler books. Thanks for linking up at Marriage from Scratch! Indeed! Skype is a great help to connect with families around the world. i haven't used skype yet but a lot of people are suggesting it. Feel free to link up with my WW. I've never tried Skype before, but I should! I know a lot of people that have and love it! Thanks for stopping by to link up! Happy WW! If no technology we cannot reach the long distance just to talk to someone hehe. Visiting form the challenge. i've never used skype before! always looks like fun!! http://www.thehunsblog.com w/ LINKY & GIVEAWAY! You cannot beat Skype for keeping in touch! Thanks for linking up at Searching 4 Simplicity! I love Skype too and it's a much better way of keeping in touch with relatives outside the country. oh, thanks to skype....:) san pala si hubby mo sis? I see the little guy behind you...ehehhee! agree, chat and sms bridge the homesick feeling of love ones. I have been though a long distance relationship in the past and back then, no skype yet. We survived with emails, phone calls, YM, and snail mails. And yes, those were more expensive means. Lol. Hooray for today's skype! we are lucky to have enjoyed all this latest communication technology, and gadget. Important for us too, since family is in Scotland. your son looks like his Daddy Sis :-) anything we can do to communicate our loved-ones is precious :-) Visiting from #31 of BPC, hope that you can return the visit too. I love skype too, especially so the kids can have a relationship with their grandma. is that your hubby sis? im an OFW for 4 years. i know how it feels like to be in abroad. kakalungkot as in. Yep, that's my husband. He's been working in South Korea for almost three years already. He left when Yue was only five months old, so imagine how difficult it had been for the three of us. 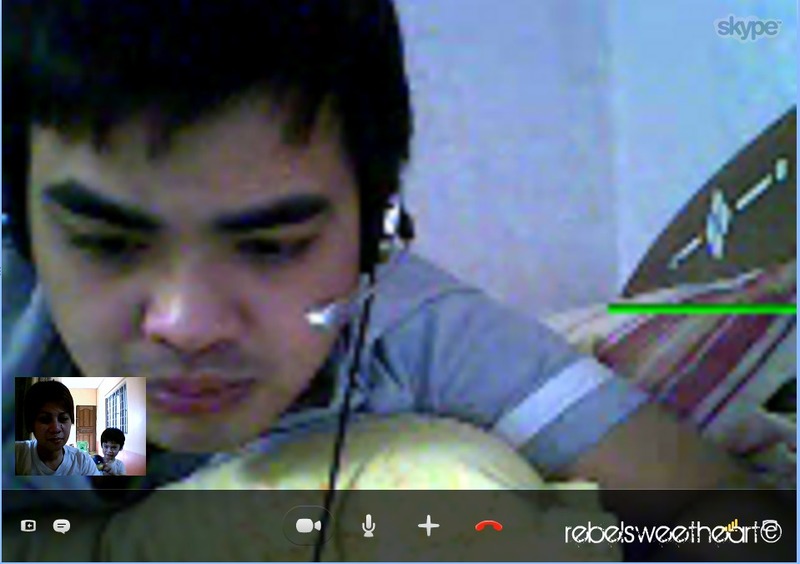 Skype made the pain a bit bearable. My parents are OFWs too, and when I was a kid we had to make do with just letters and phone calls. Times were harder back then. Visiting from Wednesday Whites, hope that you can return the visit too. hope everything is ok in your end. I need to teach my folks back home how to use skype the next time I go home. This is pretty convenient and money is not an issue here. Skype indeed does amazing things, doesn't it? i can't imagine having to be separated from our own kids last year for 10 months without skype! thanks to the wonders of technology!